Those were the words that ended it. I never said anything. I just cried until the morning and then boxed up everything that reminded me of him. I left with nowhere to go. I didn’t leave a note because there wasn’t anything to say, certainly not anything that would change anything. I’d fought hard over the last few months, and we’d only grown further apart. It’d been raining all day, atypical of Florida in March. I left work and drove around in circles while my windshield wipers pushed water. For weeks I had looked for a place to go – to restart – but it was proving hard to find a place to take the oversized dog I came with, and that didn’t expect me to put down thousands of dollars I didn’t have. I was weary and brokenhearted and sleep-deprived and tearstained. I’d been riding couches on the grace of friends and trying not to wear out welcome with any of them. If one ever hits the end of the ability to deal, I had. In defeat, I pulled the car over under a giant oak dripping rain on brick-lined streets. The water on my car quieted under the protection of it. An old-Florida, 1954 red brick mansion sat behind wrought iron gates next to me. Its year of origin and family name etched in a concrete marquee told of the journey of love, life and loss that happen under a roof. A single light lit the dining room on the ground floor, and I watched a white-haired man feed a cat under the protection of the awning. He wore a 6 PM robe and shuffled slippers like he was afraid to lose them. I wondered if he felt as alone as I did. I wondered, if I asked nicely, if he’d let me live in one of the many vacant rooms in the mansion. Before I was done entertaining the thought, he was back inside and as vanquished as the now-fed cat. I got out of the car to walk around. It was raining. I didn’t care, I just needed to walk. Life is worked out through steps under overgrown trees like those, who have seen much more of it than we have. We go. They stay. I think they know a lot more about how to do this than we do. The lake they sat around lapped with the wind and water from the sky, and rain mixed with my tears until I couldn’t tell which was which. I walked and cried and prayed until my shirt was stuck to my skin and in a silent and unnoticed moment, something slipped into my soul from one of those great trees. I exhaled into the car and sat dripping onto grey leather. It was small. Barely there. I was afraid if I reached for it, it would slip out of my fingers like a feather in the air. But for the first time since I could remember, I felt the smallest, subtlest, shimmering ember of hope, with no particular reason why. The next day I drove right past the ember lit aflame. It sat hand-written in front of a little yellow house. Five doors down from that red brick mansion. It’s just a house. Four sides built on a foundation. 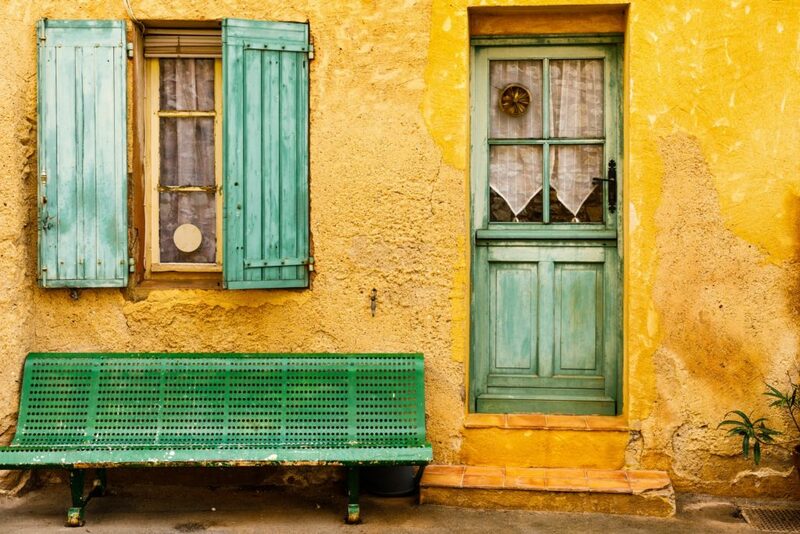 The walls are yellow, the shutters are green, and it sits simply atop a slightly raised hill – a box, basic in all it is. It’s just a house. But it’s not really about the house. It’s about a million miles. In a small chair in a small corner of a small room I started walking – one breath at a time, one step at a time, one prayer at time. The journey first to truth, a hard rage into the night, into the very heart of the blizzard storm. Facing truth, both good and bad, is never easy, but it’s some of the most freeing spend of tears I’ll ever give and never regret. It was one arduous step up a snow-blown, black mountain after another. And it wasn’t his truth. It was mine. My steps then into fire, into change, into a slow grind of alteration, chiseling, and reshaping by flame. The chink-chink of being sculpted, one hit at a time, came with every tedious step across the icy rapid of habit. It was a course set to discipline in the midst of blowing winds and changing tides with few resources and fewer chances. It was one try and one grace after another and still goes on today while I slip and get back up and slip and get back up, often to an outstretched hand. A trek then into a learned future. One meant to help, direct, and lift. One that changes from the led to the leading – to out front with binoculars and a map. A job one is only ready for with the understanding that one is never ready. I’m walking a million miles in that yellow house.